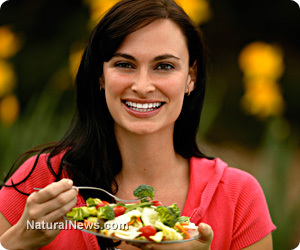 (NaturalNews) Researchers at the University of California at Los Angeles analyzed over three dozen long-term diet studies and found that about two-thirds of dieters regained more weight than they lost within four or five years after they lost it. However, one woman is giving that statistic a run for its money. She lost 70 pounds in 2007 and has successfully managed to keep the weight off for over seven years. Jennifer Lilley was tipping the scales at over 200 pounds. Sugary, processed foods were habitual for Lilley. "I was working long hours and eating dinner out of the vending machine," she says. "When I got home, I'd be too tired to work out." Eventually fed up with feeling winded walking up stairs and having to turn sideways through turnstiles, she made a healthy change. In 2006, she turned to a popular meal plan that helped her lose 70 pounds in six months. Since then however, she's managed to keep the weight off entirely on her own. She's now celebrating seven years of successful weight loss maintenance. Lilley attributes her weight loss maintenance success to incorporating more fresh fruits and vegetables in her diet. While she's not a vegetarian, she says that she goes entirely meatless "for about four out of seven days during the week" and enjoys focusing on new recipes that involve plenty of greens and fruits like cabbage, beets and apples. She often incorporates raw, organic honey in some of her recipes and believes in the health benefits of cacao powder, coconut oil, chia seeds and hemp seeds. It's no secret that fruits and vegetables contribute to weight loss. In fact, studies show that adding such foods in a diet is linked to substantial weight loss even when people were not told to restrict calories. Furthermore, it's been shown that people who consume plenty of fruits and vegetables enjoy a trim figure and longevity. She explains that "Losing so much weight is a big part of your life. It's not just, 'I lose it and then it's over.' It is a continual journey." Her long-term success has led to appearances in ads and articles in national magazines as well as in local media. She enjoys inspiring others through her web site, FlabbyRoad.com. There, she blogs about weight related topics with titles including, "Practicing Safe Sugar" and "10 Things to Never Say to Someone Who Lost Weight." She's also an author for Raw and Natural Health, where she shares recipes like avocado smoothies and cauliflower soups with health-minded individuals. She sums up her journey explaining that healthier eating habits that include fresh fruits and vegetables have been key to her ongoing success.